Despite the fact that the cartoon is wordless, it still communicates a pun. (Robert Coren wrote on Facebook that it took him a moment to see the pun, and it took me some time too.) 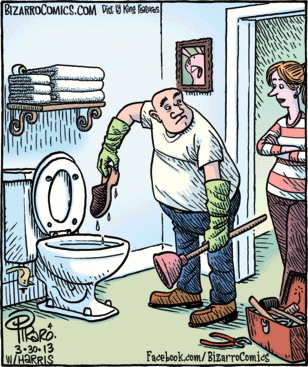 The plumber is there to deal with a clog ‘impediment, blockage’ in the toilet — note the plunger — and what he’s found is a clog ‘shoe with a thick wooden sole’ in the toilet. Not as complex as yesterday’s Mother Goose and Grimm, but trickier in some ways because you have to supply the words yourself. This entry was posted on March 31, 2013 at 7:53 am and is filed under Ambiguity, Linguistics in the comics, Puns. You can follow any responses to this entry through the RSS 2.0 feed. You can leave a response, or trackback from your own site.